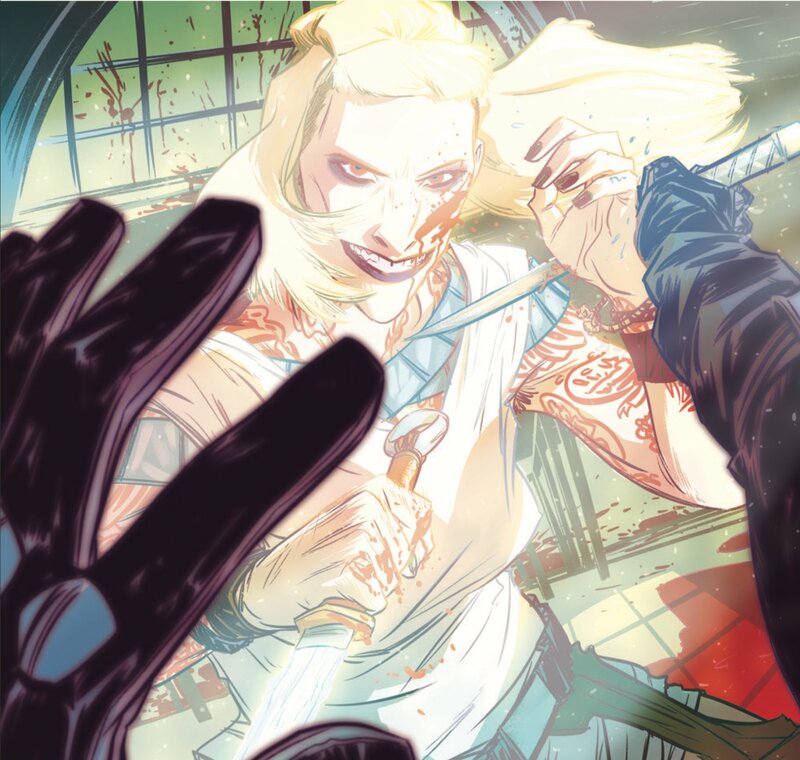 The Weatherman #5 Review – AiPT! There’s a crescendo-like feel here as The Weatherman fires ever closer to the conclusion of its first volume. Nathan finds himself in his worst situation yet (which is outstanding considering how far he’s fallen so far). Strapped into a torture device, a mysterious masked man is now auctioning off the ability to kill him in a VR game that both Nathan and the winning bidder will truly ‘feel.’ Once that’s over however, another bidder may ‘kill’ Nathan all over again. Amy is on her way to save him, but will anything be left of Nathan’s mind after he’s been tortured for so long? This story continues to evolve in ways the reader doesn’t expect. It seems as if each issue has a new comment on contemporary western culture subtly woven into its story. The concept of reality television is critiqued, as are rather more complex issues like guilt and PTSD. The cartoony artwork does a good job of lulling readers into a false sense of security. This is not a playful comic book — it’s one of the most thought provoking titles in recent months. Each issue introduces another person whose entire life was ruined by Nathan, which asks the reader whether or not they should care for this joyful, carefree man they were introduced to in issue one. Amy is certainly starting to change her mind, but perhaps this is the inverse of the reader who is starting to question their opinion of Nathan. Throughout the series, and especially in this issue, it makes people think about PTSD in a way that hasn’t been considered in some time, especially not in comics. The trademark humor of the series takes a bit of a backseat so as to allow most of the comedic elements of the issue to be told by Fox’s spectacular artwork. Overly expressive faces and exaggerated limbs provide some much needed relief from this very bleak book — bleak in the ‘do I really care about a mass terrorist?’ kind of way. Despite how great the issue is, it can’t all be good. An issue that’s persisted from the start is the confusion developed during action sequences. It’s understandable why things get quite so explosive and messy, but the artwork is just hard to follow during these sections. There’s so much on the page that readers will have a hard time figuring out just exactly what’s happening and who’s who. It doesn’t help that the cartoonish style lends itself to confusion here as exaggerated body parts can impede a reader’s ability to distinguish one character from another. For the most part the coloring fixes this, as the creators have made a conscious effort to make each character stylistically distinct. On top of this, issue five has the best coloring of the series so far. There’s a crescendo-like feel here as The Weatherman fires ever closer to the conclusion of its first volume. Continuing to be one of the smartest comic books out right now, this is highly recommended. Stylistically messy artwork might not be for everyone.